Some things in life are complicated, like trying to figure out how in the world Elon Musk thinks Tesla can produce 500,000 cars annually within two years. Other things, though, are pretty damn simple. This is one of those things. 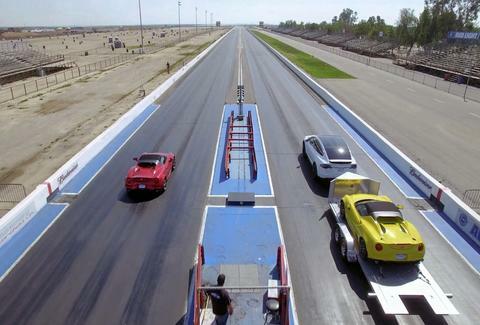 Motor Trend just took a Ludicrous Mode-equipped Tesla Model X to a drag strip and raced it against an Alfa Romeo 4C. If I told you it won, you wouldn't be terribly surprised -- that's one thing Tesla does really, really well: accelerate in a straight line. But what if I told you it was towing another Alfa Romeo 4C the entire time? 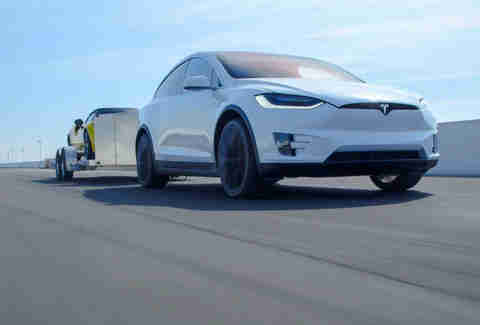 When you floor a Tesla you get every ounce of acceleration right off the bat because electric motors produce all their available torque virtually instantly. That's a big bonus when you're towing something in the neighborhood of 4,000lbs. The inverse is true with the Alfa. I've driven it; it's fun as hell, but it's not really about acceleration. Its turbocharger is peaky, meaning if you simply floor it from a standstill, it takes a fraction of a second before it's really got full power. In this case, that fraction of a second gives Tesla the advantage. Wanna know what the best part is? The 4C is an incredibly fun car, and the Model X is an incredibly quick crossover, so everyone wins. Well, unless you were driving the red 4C. Then you most definitely lost. Good show, Tesla. Aaron Miller is the Cars editor for Thrillist, and can be found on Twitter. He enjoyed his time in the 4C, but he can't help but wonder how much its inherent turbo lag played a factor in this race.